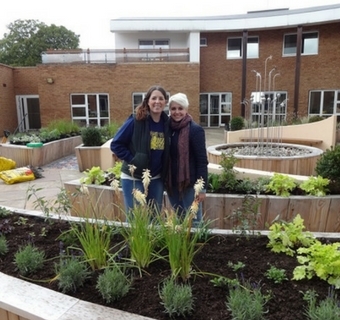 Children and their families, carers and staff at Hampton’s Shooting Star Hospice have been enjoying Greenfingers revamped courtyard garden since 2013. This hospice cares for babies and young children up to the age of 21 from the London and Surrey area. 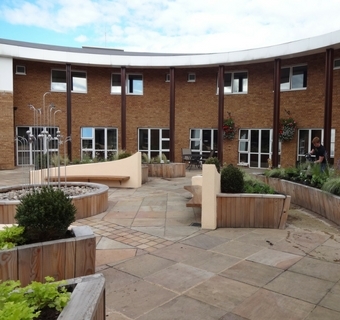 The original garden here has been redesigned to mirror the curved hospice buildings and is now home to eight beautiful cedar clad raised beds set around a stunning centrepiece of a stainless steel sculpture and fountain. Each pair of raised beds have been planted to provide a particular type of sensory stimulation and range of experiences that benefit children with different needs and challenges. the ‘movement’ beds provide vestibular stimulation from the slightest breeze and windmills and streamers set amongst the planting provide more movement. Central to the design is the bespoke sculpture and fountain which is surrounded by cobbles. Plants used include lavenders, grasses, alliums, stachys byzantine, sedums, herbs and agapanthus all underplanted with brightly coloured Spring bulbs. The whole area has been paved in natural sandstone with inset lighting so the garden can be enjoyed from dusk to dawn and each ‘zone’ has different textured pathways of cobbles, colourful mosaics, smooth sandstone and rubber play surfaces. 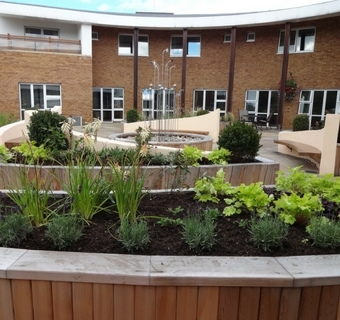 Benches have been inset to the raised beds and softly rendered walls where children and families can sit, relax and enjoy the peace and tranquillity that a garden like this brings. This garden was created with the help of fundraising initiatives organised by The Garden Centre Group.